This entry was posted in Art, Mandalas and tagged Art, Creativity, Elspeth McLean, Mandala, Puzzles. Bookmark the permalink. Now here is a puzzle that was made for you! (However, I think your painted mandalas are every bit a good.) A good thing to do on a frosty cold day where we can’t be outside more than a few minutes at a time, like today. ooo – that is lovely! I agree with Eliza. Your mandalas are just as beautiful. And I’m glad you’re enjoying this puzzle. It looks pretty fun and challenging. 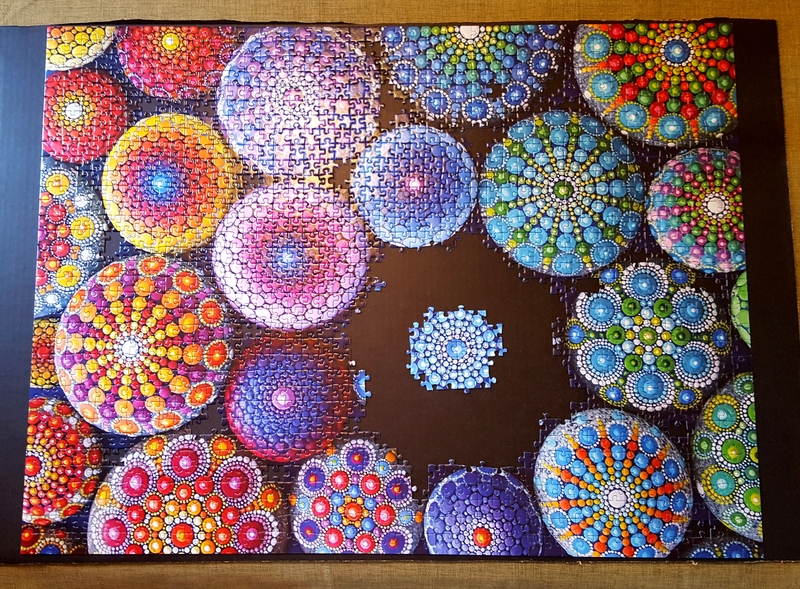 I haven’t worked on a puzzle in many years. We did them occasionally as a family when I was a kid. Enjoy! Sassy and I are intrigued by your puzzle. Although we are stocked up on puzzles right now, one day we will need a new one and I will be lookin for mandalas! So pretty! We describe ‘flow’ perfectly: the joy of being caught up in a task or play and just not thinking about anything else. A blessed state of being! It’s sooo pretty, but must have taken a lot of effort and time!